Norwegian explorer Roald Amundsen became the first man to reach the South Pole in December of 1911. More than 100 years later, an international team of scientists led by Joe McConnell of Nevada's Desert Research Institute (DRI) have proven that air pollution from industrial activities arrived long before. Using data from 16 ice cores collected from widely spaced locations around the Antarctic continent, including the South Pole, McConnell's team created the most accurate and precise reconstruction to date of lead pollution over the Earth's southernmost continent. The new record, described in an article published today in the online edition of the Nature journal Scientific Reports, spans a 410-year period from 1600 to 2010 A.D.
"Our new record shows the dramatic impact of industrial activities such as smelting, mining, and fossil fuel burning on even the most remote parts of the world," said McConnell, the study's lead author, research professor and director of DRI's ultra-trace ice core analytical laboratory, located on the institute's campus in Reno, Nev.
All measurements of lead and other chemicals used in this study were made using DRI's unique continuous ice core analytical system. Low background atmospheric concentrations, together with well-known and often distinct isotopic characteristics of industrial sources make lead an ideal tracer of industrial pollution. The similar timing and magnitude of changes in lead deposition across Antarctica, as well as the characteristic isotopic signature of Broken Hill lead found throughout the continent, suggest that this single emission source in southern Australia was responsible for the introduction of lead pollution into Antarctica at the end of the 19th century and remains a significant source today, the authors report. This study included ice cores collected as part of projects funded by the U.S. National Science Foundation. 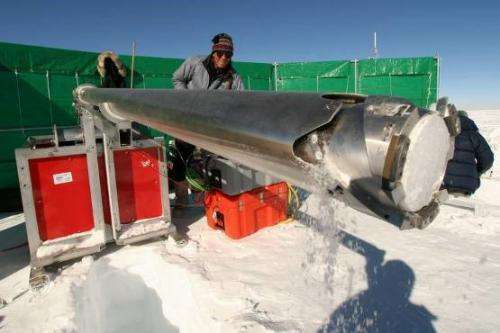 Additional ice cores were contributed to the study by international collaborators including the British Antarctic Survey, the Australian Antarctic Division, and the Alfred Wegener Institute in Germany. "The ice cores obtained through international collaborations were critical to the success of this study in that they allowed us to develop records from parts of Antarctica not often visited by U.S.-based scientists," said co-author Tom Neumann of NASA's Goddard Space Flight Center. "This included the Law Dome region of East Antarctica and a big section of East Antarctica visited by the Norwegian-United States Scientific Traverse of East Antarctica." McConnell explained the hazards of working in such extreme environments. "I remember the day in 1999 we drilled the shallow core about 15 km from South Pole. The temperature was negative 100 degrees Fahrenheit with the wind chill so it was hard to motivate the field team to leave the galley at the South Pole station that day, he said." 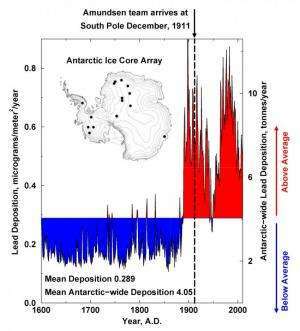 Data from the new ice core array illustrates that Antarctic lead concentrations reached a peak in 1900 and remained high until the late 1920's, with brief declines during the Great Depression and the end of World War II. Concentrations then increased rapidly until 1975 and remained elevated until the 1990's. Concentrations across the Antarctic continent have since declined, but still are about four-fold higher than before industrialization, despite the phase out of leaded gasoline and other mitigation efforts in many countries in the Southern Hemisphere, the report states. "Our measurements indicate that approximately 660 tonnes (1.5 million pounds) of industrial lead have been deposited on the snow-covered surface of Antarctic during the past 130 years," McConnell said. "While recent contamination levels are lower, clearly detectable industrial contamination of the Antarctic continent persists today… so we still have a ways to go." Much of the reduction in lead was attributed to leaded gasoline. However, the use of Tetra-Ethyl-Lead in gasoline wasn't commonplace until the 1930s. So what other processes were in use around the 1900s that might have caused such enormous releases of lead in to the atmosphere? So what other processes were in use around the 1900s that might have caused such enormous releases of lead in to the atmosphere? Coal fired powerplants (there's all kinds of heavy metals in coal: Lead, nickel, mercury, cadmium, ... ). Today these are washed out of the resulting exhausts, but back then they were just pumped into the air. To give you an idea here's an interesting factoid I found: After the electrification/industrialization campaign in Poland roughly 170 tons of lead rained down on Krakow - per year.